Burberry will launch Burberry Sport fragrances for women and men in February (look for a prestige makeup line to follow in July). The new scents "are meant to pack a high-octane punch". Burberry Sport for Women is a fresh floral by perfumers Olivier Polge and Béatrice Piquet; notes feature mandarin, sea salt, magnolia, honeysuckle, petit grain, solar notes, musk and cedar. Burberry Sport for Men is a woody citrus by perfumers Sonia Constant, Nathalie Gracia-Cetto and Antoine Maisondieu. The notes include frozen ginger, grapefruit, wheatgrass, marine breeze accord, red ginger, juniper berry, dry amber, cedar and soft musk. Burberry Sport fragrances will be available in 30, 50 and 75 ml Eau de Toilette and in matching body and grooming products. The range will be priced lower than the other Burberry fragrances. 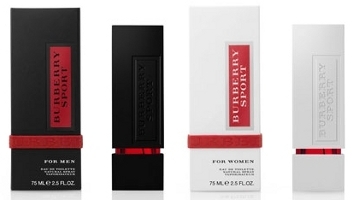 Update: see a review of Burberry Sport for men. What is a solar note? Excellent question! I’ve noticed “solar musks” in a few recent releases, and wondered if they were gathered where the sun shines? Musks that are meant to smell like the sun on skin is how I understand it. But I could be wrong — I’m not sure I’ve ever seen an “official” explanation of any sort. Used a lot these days, at any rate. Bergere, I thought, conversely, that musk came from parts where the sun don’t shine? “are meant to pack a high-octane punch”. Translation: Burberry is going after the AXE crowd. It will look like Axe, smell like Axe, will be marketed like Axe, and will be closer in price to Axe. LOL…don’t think they’ll be *that* cheap! But yes, they’re after a younger, hipper crowd. Do you mean that we at NST are not a Hip crowd??? And if the younger, hipper crowd smells like Axe, do we want to be associated with them anyway? I dunno. I certainly have, um, hips. Those 2 models look like they can barely lift a ping pong paddle! They don’t look like they pack a high-octane punch, it’s true. I was just thinking, they probably are very lovely, but why are they so angry at the person taking the picture? Is it because they aren’t allowed to eat? No, no. Not angry. “Fierce”. If you are too delicate to actually pack a high-octane punch then you must at least try to look the part. I bet she has wicked nails, though! Maybe they smelled the new Burberry before? I don’t know but the boy is by far the prettier of the 2. Hmm, where is the gasoline accord, rubber note, leather? A fresh floral hardly sounds “high octane” to me. I’d guess the frags fit the models better than they do the ad copy. The Burberry Makeup line should be interesting… I wonder what the packaging will look like. I bet if it’s covered in Nova plaid, it’ll sell really well. meh. i hope the bottle will look neat at least. It’s cute, but don’t have a picture for you. If you go to WWD now, it’s on the front cover. All kidding aside, I like the sound of these based on the listed notes. I’ve never tried any of the Burberry fragrances, though. What are the others like, in quality? My fave Burberry is the men’s London – Kevin has a great review on it here at NST. The most popular is the women’s Brit. Brit Sheer is a fruity-floral. London for women is sandalwood and cream and (to my nose), and The Beat is all pink pepper and cedar on me. My favorites so far were the Brit flankers: Brit Red & Brit Gold. Oh, and also loved the intense version of the Burberry Beat — the Elixir. Ooh… I love Brit Red in the cooler weather. Most of the other Burberrys were fine, but innocuous – except for Burberry Weekend, which was so horrible that it made me want to cut my arm off. Twice. Because I couldn’t believe that it was actually that bad and tried it again. I don’t know about the notes in this one- on the one hand it sounds like and aquatic fruity floral, but on the other hand, I like salt and solar notes. I imagine that I’ll sniff it when it comes out anyway. I always thought that a solar accord smelled like warm sand, but that just could be because there’s a note in Alien that smells like warm sand and I assumed that it was the solar accord. Robin, thank you for reminding me of Brit Gold. I loved that one. (Went through Brit and Brit Red before I realized it was Gold that I was really after.) I always forget that one when I’m loading up my virtual shopping cart at the online discounters. H., I like Voile de Jasmin, but I think I’m alone in that. That one’s Bvlgari though, isn’t it? Yes. I’m on crack. don’t mind me. I could send you my mini of Burberry Weekend, if you like. Both you and your daughter could test it. That is, if I didn’t burn it in horror – but I think it’s still around here somewhere. I think I’m scared of it now! Haunani: I thought I had sent you a Burberry Brit for Men sample…hmm… need to correct that. Anyway, I liked a couple of their regular line, and women’s Brit Red is nice (The Beat for women didn’t do it for me, but I still want to try the men’s). These, however, I’ll totally bypass. The men’s is nicer. I bought a tester of the women’s and HATED it. Turns out (I think) I sniffed the edt but bought the edp, and to my nose, they’re nothing alike. Or at least, the edp leaves out what I liked about the edt. It’s still languishing over on MUA despite numerous swap offers for it…bc of course, anyone who has wanted it has had only B&BW and VS frags to swap. I had *one* good offer, and just as I was about to close the deal… her friend bought her a bottle. Drat. Hmmm… I might be interested in swapping for your bottle of The Beat – although I don’t know if you’d be interested in anything that I want to get rid of, lol. I’m historyguru on MUA or you can get my email addy from Daisy (I’m assuming that you swap with her) or I’m in the Google Splits group, too. Ohhhh I’ll go look! Otherwise, I’m going to have to finally bite the bullet and start selling stuff on ebay. lol – I keep saying that I’m going to set up my swap list and/or sell stuff on the Bay, but I never do. Too lazy, I guess. The Beat for Women was also nothing for me. Hi Joe, you’ve sent me some great samples, but I don’t see that one in my “A to D” ziploc bag! Maybe next time we trade samples! I misread this at first and thought that it was supposed to smell like “high-octane punch.” Now that’s something I would be interested in! high-octane punch! yeah, I could be interested in a cup…er, a bottle of that too! The women’s one actually sounds interesting – as long as they leave “marine” out and leave “salt” in, it might be worth a shot. I’ll forget about it soon enough, though. Yes, why does sport=marine? Too bad. I guess it beats sauteed? I am not strictly against mainstream, there is a lot nice mainstream on the market. But this two are one of the worst experiences, the womens scent is a mix of laundry detergent and moskito spray plus toilette cleaner, the male one is generic man scent plus detergent plus moskito spry (sans toilette cleaner). After spraying some on paper I smelled at it and had two days a sore throat as an allergic reaction to the scent. The packaging is perfectly stolen from Jil Sander and another one I cannot remind of right now. Oh what a shame, I think Burberry is a really nice brand (clothes, accessoires), but not in this case. Oh, too bad! Sounds nasty.